It was recently announced that Sonic’s 20th birthday celebration, Sonic Generations, would be headed to the Nintendo 3DS. 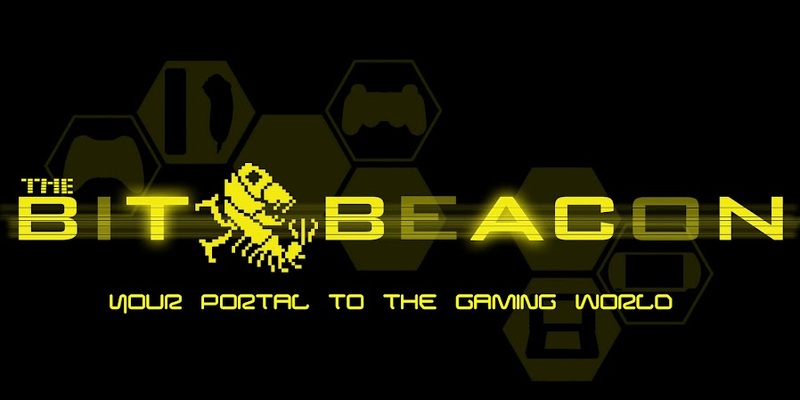 At PAX Prime 2011 I had a chance to go hands on with the game in its first playable debut in North America. The demo was probably my best experience with the Sonic franchise in over ten years. First let me start off by saying I had the chance to play the console version of Sonic Generations at San Diego Comic-Con and wasn’t too impressed. While the classic sonic stages were decent enough; the modern sonic stages were paced weirdly. Modern sonic would be zipping along at huge speeds then all of a sudden run into a wall and bring the game down to a screeching halt for several seconds. 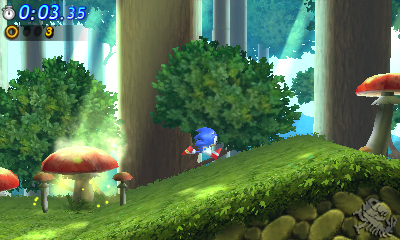 The console version of Sonic Generations had left me with mixed feeling to say the least. This was not this case with the 3DS version of Sonic Generations. Aside from sharing the name of the first zone, Green Hill, the 3DS version of the game is entirely different than the console experience. At PAX I had the chance to play through two acts from Greenhill Zone and two acts from Mushroom Hill Zone. 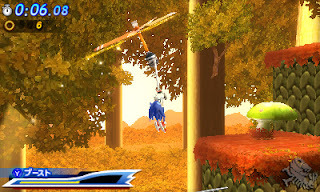 For each zone there was one act featuring Classic Sonic and one act featuring Modern Sonic. Each Sonic has their classic abilities but there is also a new boost mechanic that both characters can take advantage of. As you go through the act collecting coins and defeating enemies your boost meter fills up and by pressing the ‘Y’ button you can get a quick boost of speed. Boost can also be spammed repeatedly assuming you have enough saved up. Classic Sonic acts are designed like they should be. 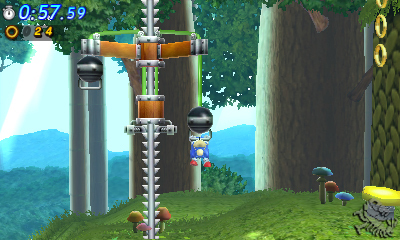 A good amount of zipping around but the game is not without its fair share of platforming. There are also plenty of routes to make your way to the end of the act. Should you work up enough speed you might be able to launch yourself up high and find an alternate path but should you fall down, and not die, you might also be rewarded with more secrets. Modern Sonic plays a lot like classic sonic. 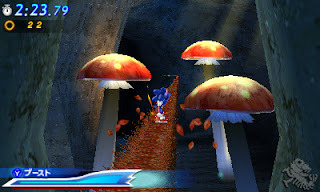 While there are camera angle changes, cinematic moments, and grind rails you still feel like you are playing a classic 2D Sonic game. 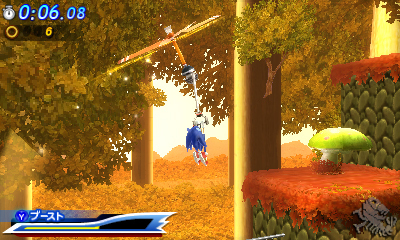 In fact I think I had more fun with Modern Sonic than I did Classic Sonic. The homing attack works out really well and helps to keep the pace of the game flowing and helps to find some additional secrets and paths. When you do mess up and get slowed down things get a little awkward, but with the boost ability it is pretty easy to get going again. One of the things I was most impressed with was the 3D. It looked absolutely gorgeous and didn’t slow the game down at all. For the most part I play my 3DS games with the 3D off, but Sonic Generations will not be one of them. My favorite thing to do with the 3D was to use the boost ability; it actually looks like the top screen is rippling from some kind of sonic boom. Veteran Sonic composer Jun Senoue is back with some new mixes of classic Sonic tunes. I made sure to bring my earbuds with me to the demo so I could get a good idea of what the game would sound like. Since Sonic Generations focuses on revisiting zones from previous Sonic games, the music is going to be taken from there. The music from the two zones I did have access to was essentially the same as their classic counterparts but with some minor differences between the Modern and Classic Sonic acts. It was definitely a nice change from the ‘meh’ worthy Sonic 4: Episode 1 music. However, the game will also touch on more recent Sonic games so it is still yet to be seen how they will approach the music there. I ended up coming back to the demo kiosk to play the game another two times and if I had to pick my favorite game of the show it would be this. If you have been looking for a genuine Sonic game for years now like me then the wait should soon be over. 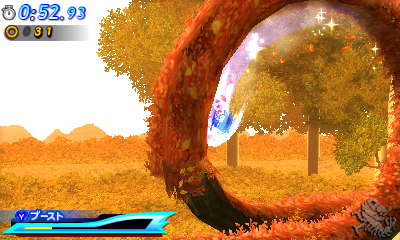 Sonic Generations for the Nintendo 3DS is set to be released sometime before the end of the year. is there a sonic generations 3DS demo in the e-shop. and will there be one soon?